The agreement, which could come as early as Thursday, would mark the biggest settlement between the U.S. government and a single company. The roughly $17 billion will be a combination of cash and consumer aid – an amount approximately equal to the bank's profit for the past three years. For the Justice Department, the settlement is the latest penalty it has lobbed against a big bank over mortgage securities. 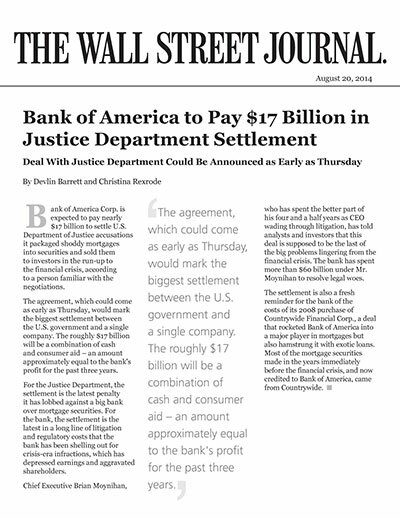 For the bank, the settlement is the latest in a long line of litigation and regulatory costs that the bank has been shelling out for crisis-era infractions, which has depressed earnings and aggravated shareholders. Chief Executive Brian Moynihan, who has spent the better part of his four and a half years as CEO wading through litigation, has told analysts and investors that this deal is supposed to be the last of the big problems lingering from the financial crisis. The bank has spent more than $60 billion under Mr. Moynihan to resolve legal woes. The settlement is also a fresh reminder for the bank of the costs of its 2008 purchase of Countrywide Financial Corp., a deal that rocketed Bank of America into a major player in mortgages but also hamstrung it with exotic loans. Most of the mortgage securities made in the years immediately before the financial crisis, and now credited to Bank of America, came from Countrywide.